Bryan, Kirk , “The Papago Country, Arizona: A Geographic, Geologic, and Hydrologic Reconnaissance, with a Guide to Desert Watering Places ,” Arizona 100: Essential Books for the Centennial, accessed April 21, 2019, http://speccoll.library.arizona.edu/online-exhibits-dynamic/az100/items/show/122. 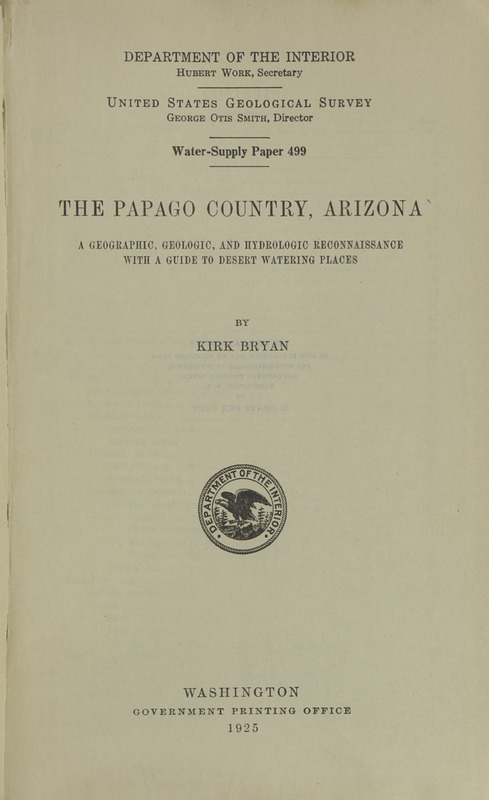 In this report, Bryan, later a geology professor at Harvard, surveyed the wells, streams, stock ponds, and natural waterholes from Tucson to Yuma, including the Tohono O’odham Reservation. The results reveal how precious water really is and how hard Native Americans and pioneers worked to tap enough for household or livestock. Bryan writes authoritatively about the region’s hydrology, geology, and even includes much information on its history, mines, and living resources, but his account reads more like a popular book than an agency report. --Bill Broyles. Washington, D.C. : Government Printing Office, 1925.
v, , 1-4, 317-429 p. pl. I-III, XVI, XXIII-XXVIII. 23cm.